Los Angeles, CA – A memorandum from the U.S. Fish and Wildlife Service announced recently that the current administration has rescinded the ban on elephant “trophies” – meaning tusks, feet, and other body parts, brought into the country by big-game hunting Americans. Trophies will be allowed for import on a “case-by-case” basis. Society for the Prevention of Cruelty to Animals Los Angeles (spcaLA) vehemently opposes this position. Elephants have been on the endangered species list since 1979 and their population has dropped dramatically due to poaching, the hunger for ivory trophies, and human kind’s general disregard for their natural habitats. While the hunting of a threatened species is unconscionable, the permitting process is extremely troubling and should alert anyone in favor of fair governing. The 140-year-old Society has continually advocated for elephants and other wild protected species. 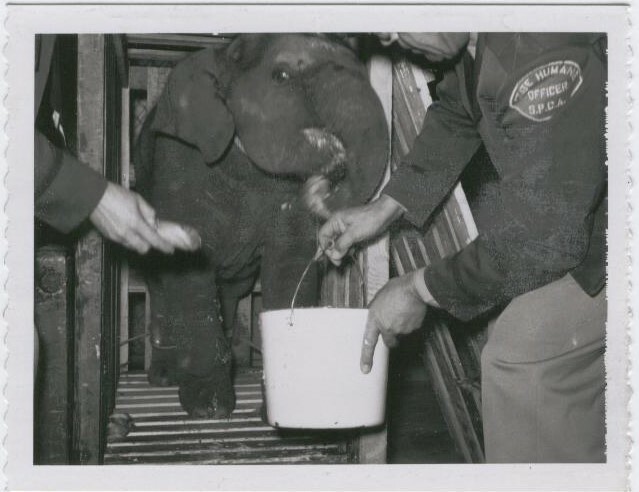 Starting in the 1900’s and continuing to modern day, spcaLA investigated allegations of animal cruelty involving elephants at zoos and traveling circuses; advocated for the ban of elephants used in traveling circuses and the ban of inhumane training methods, such as bullhooks; called for a boycott of circuses and other venues using live elephants as entertainment; and advocated for the removal of Billy the Elephant from the Los Angeles Zoo and the improvement of the zoo’s elephant habitat. “To allow the continued destruction of these majestic creatures for sport is a travesty, cruel, and not the mark of an evolved society,” said Bernstein. Today in California, State Senator Henry Stern announced legislative action to prevent the possession of elephant trophies in California. Californians can find their representatives to express support at www.govtrack.us/congress/members. Furthermore, Americans who are concerned about the slaughter of elephants for their body parts can contact their members of Congress (www.govtrack.us/congress/members) and contact the US Fish and Wildlife Service at www.fws.gov.